There is an image floating around social networks proclaiming: “Only 10 Saturdays until Christmas!”. It seems odd, and pressing. Today a friend from back home arrives to stay with us. I realized that he is an old friend, despite having met him when I was 27… I’m old enough to have friends that I met in my late 20s, and have known for a decade. He and I were roommates in the last apartment that I lived in in Chicago, before I left. That leaving was such a shocking, but natural fissure in my life. As I get older the things that sit on my personal time line, like mines having gone off, retain their potency, but patina in such strange, mutable ways. When I think of leaving Chicago, I think of breathing after so many years of having prevented any breath. I think of an animal shaking off trauma, just before it darts for the forest line and is gone. I love Chicago, I miss Chicago, I doubt I will live there again. In retrospect, and in my writing, what the city is and was for me was an unhealthy relationship of supreme, terminal love — on a cellular level. A meshing and fusion that can’t be undone. A permanent imprinting. And habitual mistreatment. But I think that’s what Chicago is; it’s how it treats its citizens… a punch to the sternum, then it goes in for the cuddle. I was always asking that city for things it wasn’t capable of giving, and it always wanted me to be different than I was. This was supposed to be a post about time. Maybe it is. Every year, multiple times, I try to figure out how I got here. And how I am still here. Portland is not my place, but Portland wants me. Portland welcomingly spreads out, and gives and gives. But Portland can’t tattoo itself on my vein ways. It’s not my familiar. I’m always a refugee here, or in exile. Equal parts both. Only 10 Saturdays until Christmas. So, only 9 Saturdays plus a few days until my birthday. Back home, I would often gather some friends and family and head to the Walnut Room for birthday lunch and then The Art Institute after. My family had done that a few times when I was very small. 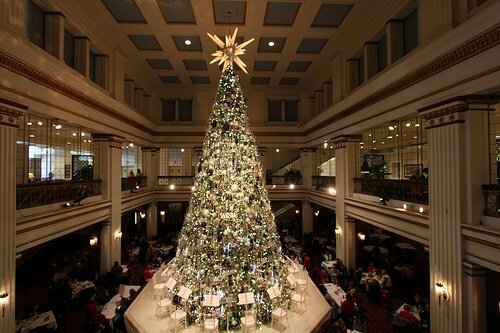 An early memory is of a piece of Buche de Noel set before me in that room, next to the huge Christmas tree. As an adult, it was equally delightful to eat there, surrounded by dressed-up elderly patrons, and moms with kids. There is something strangely nourishing about the loneliness of being next to that huge tree, the ceremony of the season, and the terminal isolation that the city and its architecture provides that I always long for. But then, I was growing so tired of being lonely amongst so much that I loved, living in it, but not being able to get what I needed. It’s come Autumn and Winter that I miss home the most. I love layers and layers of woolens. I love snow. I love being slapped in the face with cold when the door opens, and the room sighing its warmth back when the door closes. I miss sitting by the lake in Evanston, alone, when the sun is fading white gold and brass colored. I miss my old roommate. I miss the Music Box and the old Fine Arts theater. I miss trains. But the best Christmas I’ve ever had was two years ago. Having a lot of German blood, from my Mom’s side, while growing up our family opened gifts and did the primary celebrating on Christmas Eve. This puzzles my husband, whose adoptive family is terminally English. Two years ago I gave up trying to make Christmas Eve *magical. * It’s just the two of us anyway, and the dogs. And Matt barely eats so even if I go all-out on a meal, it’s is pretty lost on him. That year we opened gifts early, had Old Fashioneds per his family’s tradition, and went out to eat at an Indian restaurant. The city was dead but string lights pressed against windows towards quiet, grey streets. We walked around and saw only a few others — people with nowhere to go or avoiding where they were supposed to be going; a few tourists. We walked past windows where people sat at meals chuckling and drinking. I remember how quiet it was, how empty outside on the street. After dinner we went to a movie in a theater with only a few other hardened holiday soldiers in the seats aside from us. And then we walked to church for midnight service. It was an extremely simple holiday. In retrospect, I think what is most indelible is that by breaking tradition it was acknowledging (personally, internally), that the holiday had become about me waiting for someone(s) that wasn’t/weren’t coming. And who those people are, and what they were to me, or what they could have been, or could be to me. I remember shockingly early memories of from this life. It has always startled people how early my memory can track back, which later became surprising because of the sheer years in the middle that my brain has wiped out. One very early memory is when a terrible thing happened, and due to it I was in a liminal state, not in this world and not in the other. While in that place, suddenly my Grandfather, who had passed the year before I was born, was standing on my left holding my hand. We were on a cold, dark street at night, under a street lamp glowing cold white light. We were dressed for the chill and looking up at a large white house. Inside, my family was gathered around big table, eating a large meal. Some of them I recognized and some of them I just knew were family. I looked up at my Grandfather and asked him if I could stay with him. He frowned and said no. I mention this because last week I was driving home at night and puzzling over intimate worries: all of the miscarriages this year, another year without children, losing each of those. The loss of Matt’s dad. Complicated relationships. People I miss. How depleted we are. Raw. And I was panicking about writing and fears of dying without having published or written what I want to. I pulled in the driveway and got out of the car, walking over to the quiet, cold street to get the mail. I was directly under the newly installed street lamp, flipping through envelopes and instantly heard, from a place deeply-seated in me, a male voice say: It’s all going to work out. Just like that. Here is the point where I would usually take strings from each theme of this piece, relate them in a subtly sentimental way and tie them up to end on a tidy, but potent note, but I’m really disinterested in tidiness. I’m really disinterested in zing-y endings. Interestingly, for someone that spins their brain and mentally chews it into a sad wad of pulp daily, I didn’t think anything immediately after that moment happened, I just stood under the street lamp, looked back at our house, and a split moment of peace and faith that it was true: It’s all going to work out. Of course, that moment passed and I started wondering exactly what that applied to, but try as I might to parse it, I know the statement applies to everything. Knowing that, deeply, on a daily basis is the difficulty. Especially when what I want, what I need, and what I end up with are such different things. (It should be noted that I I have pneumonia. Again. This is at least my 12th bout of pneumonia in my life. I rank them, from least scary to, ‘holy-wow, I can’t believe I am still alive.’ This one is high up there and is probably partly the cause of homesickness, wandering thought, and fretting about having faith. Pneumonia is an amazing illness. It sits you back, down, hard into yourself, like you are piloting your body from a tiny, tiny room. And everything feels a hundred times more potent than it normally does, yet strangely removed. All that I wanted when I was small (and all I did for a while) was to dance. Through an early and quick series of painful events, dance was nearly ruined for me entirely, but I have never not-known that it was at my core. My fixation on dance and ballet has always remained. I see ballet as a large metaphor for what we ask women (and men, but less so) to do and be in our culture, which is why I find this video fairly thrilling. It’s like The Red Shoes, but taken to the next level.